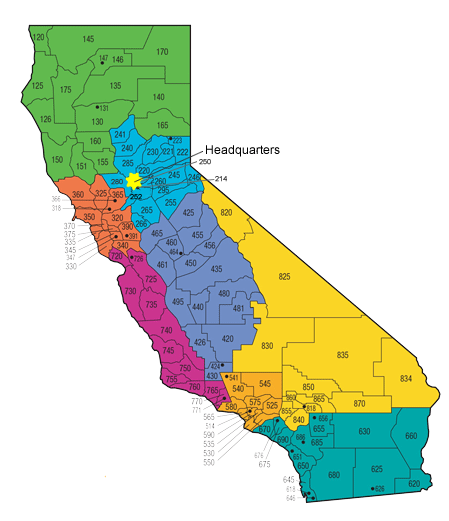 The CHP has Area Offices, Inspection Facilities, and Communication & Dispatch Centers throughout the state. To locate your nearest Area Office, use the search box or division map below. On February 9, 2018, Governor Edmund G. Brown Jr. appointed Warren A. Stanley as the 15th Commissioner of the California Highway Patrol (CHP); a Department with more than 11,000 members. As the leader of the largest state law enforcement agency in the nation, Commissioner Stanley is responsible for maintaining the safety and security of millions of residents and visitors across the Golden State. Prior to his appointment to Commissioner, he served as the Deputy Commissioner and was responsible for the day-to-day operations of the CHP. 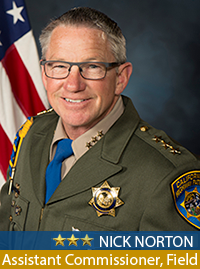 Commissioner Stanley has been employed with the CHP since 1982, and is one of the distinguished few to hold every position from Officer to Commissioner within the CHP. Commissioner Stanley has demonstrated an unwavering commitment to public service, and is firmly dedicated to earning the public’s trust through enhanced accountability and transparency. Throughout his career, Commissioner Stanley has been a leader within the Department and the community, actively participating in programs such as the Chips for Kids toy drive, the Martin Luther King Day Parade, the Lupus Race for Life, the Special Olympics Torch Run, Mothers Against Drunk Driving campaigns, and community outreach projects throughout California. Commissioner Stanley holds a Bachelor of Science degree in Criminal Justice from California State University, Los Angeles, and is a graduate of the Federal Bureau of Investigation, National Executive Institute. Commissioner Stanley is the first African American in the history of the CHP to hold the rank of Commissioner. Deputy Commissioner Scott Silsbee is a 30-year veteran of the California Highway Patrol (CHP) and has served the CHP in a multitude of assignments. Some of his assignments include serving in the CHP's legislative liaison office, acting as the Mobile Field Force commander assigned to the Hurricane Katrina aftermath and commanding the Department's Labor Relations Office. Deputy Commissioner Silsbee served as the CHP's Chief Information Officer for several years before taking over the command of the Protective Services Division where he had direct oversight of the Capitol Protection Section; Counterterrorism and Threat Awareness Section; Dignitary Protection Section; Emergency Operations & Safety Services Section; and Judicial Protection Section. In May of 2015 then Chief Silsbee was promoted to Assistant Commissioner, Field where he oversaw all field operations, including the Office of Air Operations, and Protective Services Division as well as all eight geographic field divisions within California, comprising of over 102 field offices and personnel. In February of 2018, Assistant Commissioner Silsbee promoted to Deputy Commissioner. Commissioner Norton is a 29-year veteran of the California Highway Patrol (CHP) and responsible for the administration of all field operations, including the 8 geographical Divisions; Protective Services Division; and the Office of Air Operations. In April of 2018, Chief Norton was selected by Commissioner Warren A. Stanley to serve as the Department’s Assistant Commissioner, Field. 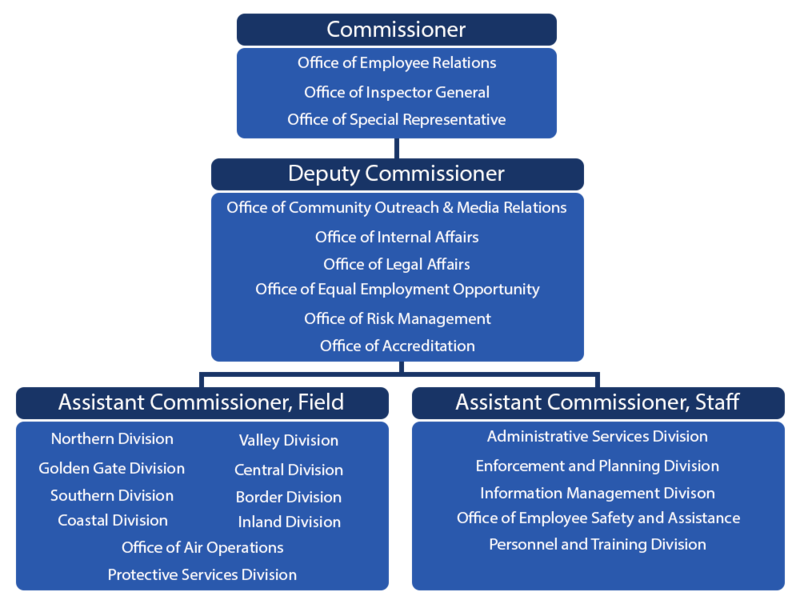 Commissioner Norton’s career has taken him on a statewide journey through various field and staff assignments that ranged from locations such as Central Los Angeles, Sacramento, the Central Coast, and the Central Valley. Commissioner Norton earned a Bachelor of Science degree in 1985 from California Polytechnic State University San Luis Obispo, has completed several courses in emergency management, personnel management, terrorism and homeland security, and is a graduate of the Police Officer’s Standard and Training Command College. During his off time, Commissioner Norton enjoys spending time tending to his small farm and enjoying outdoor activities. He is especially proud of his son and daughter, who have both followed in his footsteps and have chosen a career with the CHP. 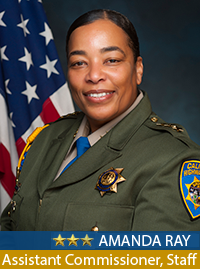 Assistant Commissioner Amanda L. Ray is a 27-year veteran of the California Highway Patrol (CHP). She has earned numerous awards and commendations in her personal life, during her professional career with the Department, and holds a Bachelor of Arts Degree in Psychology from the University of California, Berkeley. In April 2018, Assistant Commissioner Ray was selected by CHP Commissioner Warren A. Stanley to serve as the Department’s Assistant Commissioner, Staff. With an operational budget of over 2.4 billion dollars, and one of the largest law enforcement agencies in California, she provides Executive level oversight of the Department’s four administrative Divisions, and serves as the Department’s Fiscal Officer. Commissioner Ray has been a pioneer for women in law enforcement as the first African American female officer in the CHP’s history to rise to the rank of Chief, and now as Assistant Commissioner, Staff. Commissioner Ray served an integral role as the Department’s first female officer to be assigned as the Special Response Team Tactical Commander during Super Bowl 50 held at Levi Stadium in Santa Clara, CA. Her vast field experience has allowed her to effectively serve as incident commander during a variety of several other high-profile events including the Occupy Oakland and Occupy Marin events in the San Francisco Bay Area. As a leader in law enforcement, Commissioner Ray holds firm to the values set forth by the CHP’s Public Trust Initiative to serve and safeguard our communities with compassion and understanding. Throughout her career, Commissioner Ray has actively engaged with the communities she serves, seeking every opportunity to participate in outreach events, and active involvement in departmental programs to provide the highest level of Safety, Service and Security to the people of California.